The Supr eme Court of India has given new interpretation of section 497 of IPC on historic day of 27 September 2018 and declared section 497 of IPC as unconstitutional. The monumental judgement in the history of India has been given by the five-judge Constitution Bench, headed by Chief Justice of India (CJI) Dipak Misra and consisting of Justices Rohinton Nariman, AM Khanwilkar, DY Chandrachud and Indu Malhotra. The recent judgement of Supreme Court has overturned last three judgements related with section 497 of IPC. According to the new ruling adultery regarding the male is not a crime. Our Indian society in the world is recognised by our Indian values, tradition, culture and customs. Marriage is one of the important culture of Indian society. The new ruling creates a threat for marriage. The society, feelings, emotions, ideologies related with sexuality and sexual desires are changing these days due to pressures and complexities of life. The new relationships among the indiv idual in the society will create complexities, expectation and confusions. These problems and challenges of life is diluting the strength of husband-wife’s trust and companionship. It is a kind of marriage reversal concept. It will badly and negatively effects our children and parents. It will finish the nourishment and nutrition of family very soon. It will lead to emotional, mental and physical unnecessary stress and insecurity for both the partners. Sometimes these other relationships creates disturbances and an emotional blackmailing with lots of negative consequences. Section 497 declares adultery is not a crime but adultery was a ground for divorce under section 13(1) of Hindu Marriage Act, 1956. I think at this level Indian society need more reforms and amendment in this regards for further improvements in the relationship issues because these days India is going through transitional phase. This new judgement is just a initial step towards a revolutionary transformation, progressive and developed society. This ruling is emerging with western values of individuality, individual freedom, liberty and giving decision making right in sexual relations. 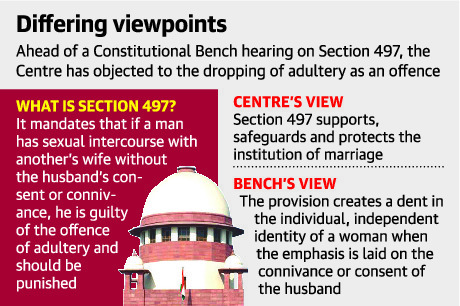 The society welcomes the new ruling on section 497 of IPC. The brings justice, freedom, liberty and equality between male and female in the society. The new judgment creating space for the new definition of morality, humanity, dignity and equality to women. This explores the new possibility of gender neutral laws in India which will give a chance to people for more open, tolerant and transparent society. If we analyse it completely we can say that somewhere it lead to mental- emotional peace and sexual satisfaction for the individual. People will become more open and truthful. Till date, in Indian society women do not have any right to speak out her desire. Women have never spoken and expressed themselves till date, but now they have the power of expression with legitimacy. Every individual has a perception and choice for sexual desire and right to choose a partner. Now it does not matter that the person is male or female. If suppose many people are genuinely truthful to their wife so they will and those who are not till date they will never be truthful to anybody in any relationship. So by this way we can say that nature of a particular person will not change, whether the law is there or not. While looking through the judgment we need to study the practical aspect and future implication of the matter. This ruling may lead to more transparent and long term positive relationships among the individuals. This ruling also helps out in changing the patriarchal mindset of the dominant males in the society. Women will no more considered as the property status for men. It will also bring revolutionary change on dependency of women on men and develop the culture of independent decision making practice of Indian women.